Some great news to share with you today! 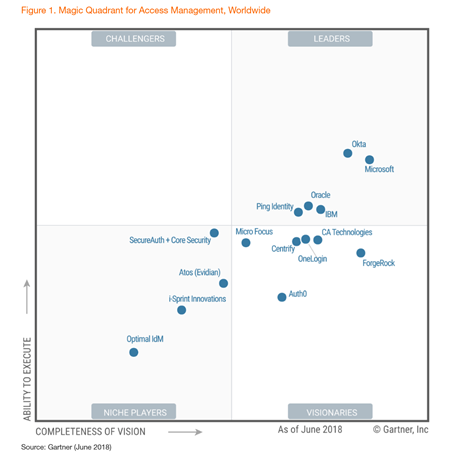 For the second year in a row, Gartner has positioned Microsoft in the Leaders Quadrant in the 2018 Magic Quadrant for Access Management, Worldwide, based on our completeness of vision and ability to execute in the access management market. Find out why in a complimentary copy of the report here. According to Gartner, Leaders show evidence of strong execution for anticipated requirements related to technology, methodology, or means of delivery. Leaders also show evidence of how access management plays a role in a collection of related or adjacent product offerings. Microsoft is positioned the furthest in completeness of Vision in the Leaders Quadrant, for the second straight year. We believe our jump up in Execution also illustrates how important it is for us to execute on a strategy that can help organizations where they are at today and prepare them for the identity needs of tomorrow. 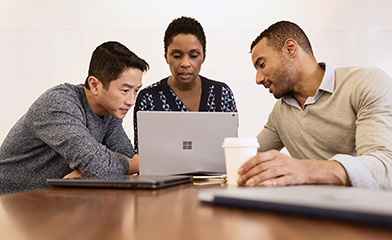 At Microsoft, we champion conditional access policies and threat protection for identities as critical capabilities for a world-class identity and access management solution. As part of a rich ecosystem with Windows 10, Office 365 and EMS, we’ve worked hard to integrate security policies across products to give you visibility and control over the full user experience. We’ve also taken in the insights and feedback from our customers this year to improve the experience and make it even easier to get all your identities in one place. We are committed to providing innovative and comprehensive identity and access management solutions for your employees, partners, and customers. We could not have continued to be a leader in this space without the input and support from our customers and partners – thank you! This graphic was published by Gartner, Inc. as part of a larger research document and should be evaluated in the context of the entire document. The Gartner document is available upon request from Microsoft.